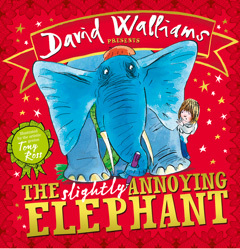 PREVIEW: David Walliam’s new picture book The Slightly Annoying Elephant – Out Now! David Walliams’ first ever picture book is out right now! What’s big, blue, bossy and turns up uninvited? A slightly annoying elephant of course! The Slightly Annoying Elephant tells the story of a boy called Sam who finds a great, big, gigantic, ginormous elephant on his doorstep one day! What will happen next? You’ll have to read the book to find out! It’s by bestselling children’s fiction author, David Walliams. And as it’s a picture book, there’s loads of brilliant pictures from award-winning illustrator Tony Ross too! You can get the book right now by clicking here. And you can also find out more and play fun-tastic David Walliams games at www.worldofwalliams.com. Click here to check it out!